Thirty years passed between the first perpetual calendar wristwatch, and the first one with a leap year indicator, made by Audemars Piguet in 1955. 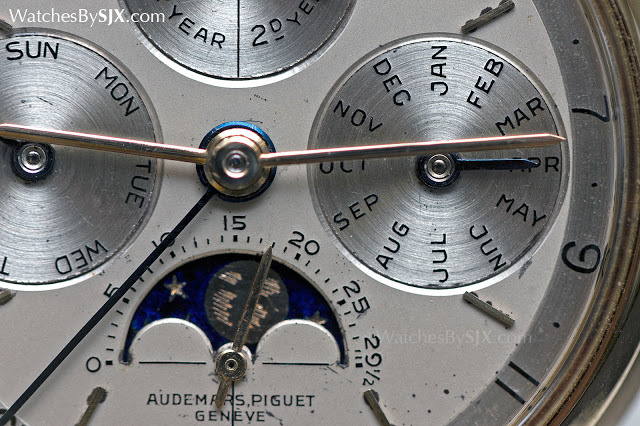 Here's a look at one double-signed example of the Audemars Piguet ref. 5516. The perpetual calendar complication reached the wristwatch soon after it was popularised by troops during the First World War, albeit only in one of a kind timepieces. The first perpetual calendar wristwatch was a one-off timepiece made in 1925 by Patek Philippe, equipped with a movement made for a ladies’ pendant watch. 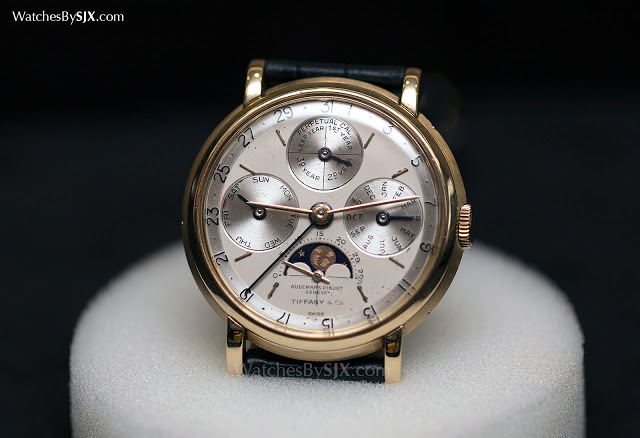 And four years later Breguet completed a perpetual calendar wristwatch with a wristwatch movement. But those wristwatches only had the day, date, month and moon. Despite being de rigueur in modern perpetual calendar wristwatches, the leap year only arrived in the wristwatch in 1955, courtesy of Audemars Piguet. That was the year Audemars Piguet introduced the reference 5516 perpetual calendar wristwatch, the first serially produced wristwatch with a leap year indicator. By comparison, the first such perpetual calendar from Patek Philippe was only produced in 1981 (and sold in 2013 for US$1.7 million). Only 12 of the ref. 5516 were made, and only nine of those had the leap year indicator. The first three of the ref. 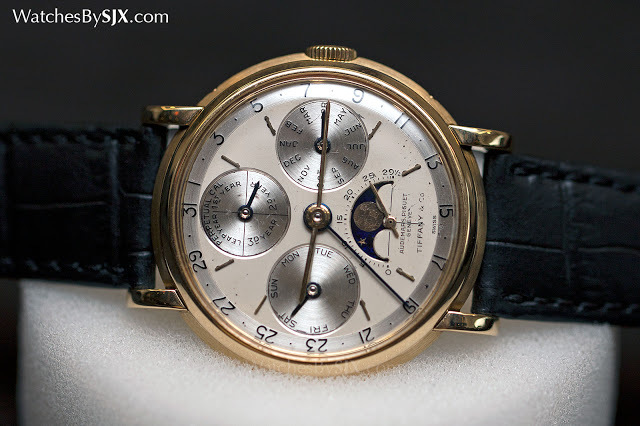 5516 had the moon phase at 12 o’clock and the leap year display at six (Christie’s sold one example for US$314,000 in 2008), before evolving into the final iteration of the ref. 5516. Depicted below, the final version of the reference is arguably the most beautiful, with a visually balanced and functional two-tone dial. 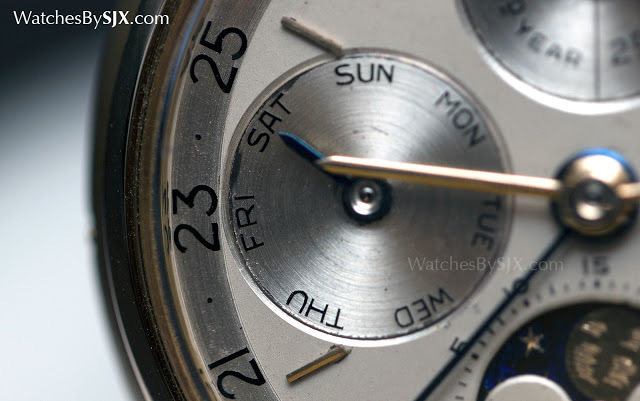 Made in 1957 but only sold in 1969 – the long interval between the two was not uncommon for pricey, complicated watches in the mid-20th century – this ref. 5516 is in yellow gold. And this particular specimen, part of the Audemars Piguet museum collection, is double signed with “Tiffany & Co.” below the watchmaker’s label. This has a striking two-tone dial, with sunken sub-dials finished with circular graining. The lettering on the dial is prominently raised, because it was made the old fashioned way. Instead of merely being printed, the lettering is created by filling recesses with enamel, a technique known as champlevé. Practically non-existent today, champlevé lettering never fades. The ref. 5516 is powered by the calibre 13VZSSQP, one of the most important base movements for high-end watches in that era. 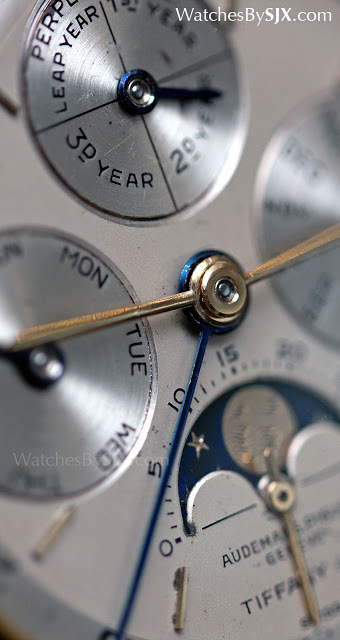 The VZ series of movements were made by Valjoux, a movement maker now part of ETA. It’s best known for the mass market 7750 chronograph movement now, but it used to make much more refined calibres. Thirteen lignes in diameter, the VZ series eventually evolved into the Valjoux 23, 72 an so on. These movements were used in a variety of watches from the best names in Swiss watchmaking, including the Patek Philippe refs. 1518 and 2499. Rare and historically important, the ref. 5516 is just one example of why the perpetual calendar is arguably the most significant complication for Audemars Piguet.